Oppo A7n is a new device which has been launched in China with MediaTek Helio P35 SoC. This budget-friendly device has been listed on the companies website and looks similar to the Oppo A5s that was launched earlier. The device will be available in Lake Light Green color option and there is no news about the global pricing or the availability of the device yet. The listing of the device reveals the Hyper Boost acceleration engine of the device which is expected to enhance the performance and gaming experience. The new Oppo A7n will be featuring a 6.2-inch HD+ (720×1520 pixels) display along with 270 ppi of pixel density along with 19:9 aspect ratio. The handset will be coming with a water-drop notch display that houses the selfie camera and it will be powered with a 4230 mAh battery, but nothing is known about fast charging technology support. Under the hood, there is an octa-core MediaTek Helio P35 chipset coupled with IMG GE8320 GPU and 4GB of RAM. There is a dual rear camera setup on the rear that includes a 13MP main camera sensor along with f/2.2 aperture along with a 2MP secondary camera with f/2.4 aperture. There is also a 16MP selfie sensor on the front which comes with many AI features. Furthermore, the device comes with the options like preloaded portrait mode, blurred background, AI backed beautification and few other features that enhance the camera capabilities. There is 64GB of on-board storage on the device which could be extended further up to 256GB via microSD card slot. It will come out of the box with Android 8.1 Oreo operating system with ColourOS 5.2 on top and might get further updates also. The handset measures 155.9 x 75.4 x 8.2 mm and weighs 170 grams and has connectivity options like 4g VoLTE, Wi-Fi, Bluetooth 4.2, USB OTG, NFC, 3.5mm audio jack, and a MicroUSB 2.0 port. 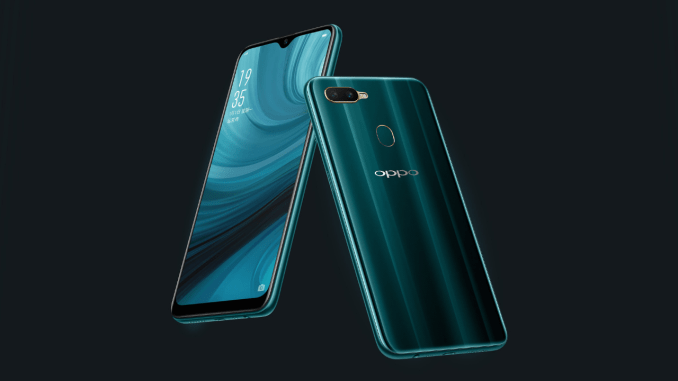 Recently we have seen Oppo launching its Reno series in China where the top end Reno device is powered with a 7nm Qualcomm Snapdragon 855 SoC and also has a periscope style telephoto camera with 10x lossless zoom. Well, the Oppo A7n will retail CNY 1499 (approx US $223) and further availability and pricing in other markets will be known soon. Comment in the section below and stay tuned to Android Advices for more.